Looking at the first picture reminds me of a scene in Star Trek VI where Mr. Sulu takes a fall while exploring a "nuclear wessel" and is left unconscious. By the time Kirk and Dr. McCoy get to him, the doctors have prepared Sulu for 20th-century-style brain surgery. McCoy is abhorred over the "barbaric" technique that actually requires cutting open the skull to treat the injury. Instead, the good doctor passes his humming little device over Mr. Sulu and heals him instantly. 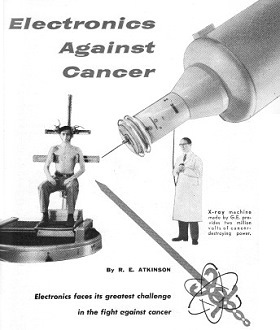 Can you imagine being fraught with cancer and then being strapped into the chair as shown with that huge hypodermic-needle-looking thingy pointed at you? A lethal injection might have been preferred over that experience. As usual the pioneers took the arrows so that we can benefit from the treatments enjoyed today. Someday, if mankind or an asteroid doesn't wipe out civilization, we probably will reach the point of Dr. McCoy's magic brain healing box. 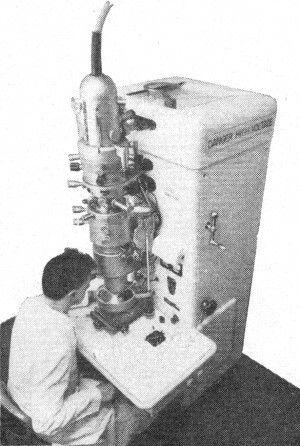 X-ray machine made by G.E. provides two million volts of cancer-destroying power. Once the word "cancer" was whispered. Now we say it firmly, as a challenge. People are learning to spot the signs of early cancer, and are seeing their doctors regularly; alert physicians are also detecting cancer in time to remove malignant growths before they can spread. The situation is far from hopeless. Statistics show that more and more people are being saved from cancer each year. Dramatic examples of electronics being used to help mankind are found in the battle against cancer. Electronic devices are invaluable in the diagnosis and treatment of cancer, and more important, they promise to provide the key which will open the door to an understanding of what causes normal cells to start multiplying wildly and grow into malignant masses. In the field of cancer diagnosis, radioactive chemicals injected into the blood stream act as invisible bloodhounds which track down malignant tissue. In the treatment of cancer, atoms and electrons are used to destroy cancerous areas, even those deep within the body. Ultrasound, too, has been used to shatter malignant cells under the skin. Electric shock has been employed in a few cases to relieve pain, and cancer research leans heavily on electronic instruments such as the electron microscope. Cancer Therapy. A big gun in our anti­cancer arsenal was unveiled this March at the Brookhaven National Laboratory, Long Island, N. Y. A uranium-powered 1000-kilowatt atomic reactor has been completed for use in medical research and treatment. 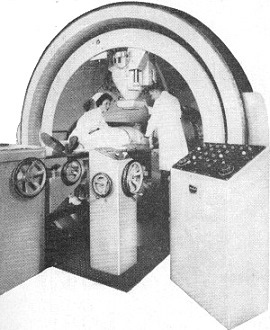 The first reactor specially designed with medical uses in mind, the Brookhaven installation is integrated with a research center and hospital. Cancer is its chief target. One of the experimental techniques that scientists at Brookhaven are working on is a treatment called "neutron capture." Boron, a chemical which "captures" a large number of neutrons, is carefully injected into the patient's blood stream. After the boron is carried by the blood to an area known to be cancerous, neutron particles from the atomic reactor are beamed directly at the tumor area. When neutrons strike the boron, the resulting radiation kills the tumorous tissue with little damage to surrounding healthy tissue. Treatment is promising, scientists report, but is still in the research stage. Most powerful of all the weapons against cancer is a kind of X-ray machine called a "synchrotron." While X-ray machines used in cancer therapy in the past generated 250,000 volts, the University of California synchrotron generates an X-ray beam amounting to 70 million volts. The synchrotron's high power is equivalent to penetration power and is of value when a tumor is located deep within the body. Of course, brute force is not enough. The problem in treating cancer with X-rays is to destroy the cancer tissue and leave the adjacent healthy tissue undamaged. Consequently, although the synchrotron produces enormous power, its accuracy in focusing beams of cancer-killing X-rays is a marvel of engineering. Cancer Can Be Cured. In the therapy of cancer with X-rays and other methods, the primary interest is in curing the patient outright. The Cured Cancer Congress, which met recently in Washington, D. C., is living testimony that cancer can be cured. To qualify as a member of the Cured Cancer Congress, a cancer victim must have had no sign of the disease for five or more years after treatment. This year 40 delegates represented almost one million Americans cured of cancer. Many of these people would not be alive today if it weren't for medical electronics. For example, Mrs. Richard A. Flacco of Bellflower, Calif., received surgical treatment of an abdominal cancer after X-rays revealed it in time for early care; follow-up radiation treatment finished the job. Mrs. Flacco leads a normal life today and two of her three children have been born since the surgery was performed. 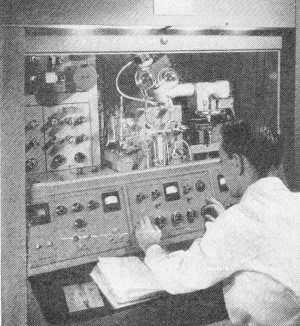 Radioactive cobalt machines such as the one shown above can produce radiations equal to those from a 3,000,000-volt X-ray. These radiations destroy malignant tissues. Just as early and accurate diagnosis was so important to Mrs. Flacco, it is vital to the well-being of hundreds of thousands of people. One of the most promising electronic diagnostic devices is the "cytoanalyzer." Cancer cells have a peculiar center, or nucleus, by which they may be identified, and the cytoanalyzer looks at slides of cells and measures their degree of density from nucleus to outer edges. Thus, it is capable of determining which cells are cancerous. The cytoanalyzer is many times faster than a human lab technician, scanning each slide in less than one fifth of a millisecond. In a test recently reported by the National Cancer Institute, the cytoanalyzer was fed over 1000 slides to analyze. Technicians had already determined that 20 of these slides contained specimens of cancer cells. The cytoanalyzer detected everyone of these slides, and also labeled a few others as "suspicious." The radioactive isotope - another diagnostic aid - has been called a hitchhiker with a walkie-talkie. If it finds cancer, it reports back to an isotope counter. Here's how it works. After scientists find chemicals that are especially attracted to cancer tissues in certain parts of the body, they "tag" them with a small dose of radioactivity. Examination of cells suspected of being cancerous is speeded by the use of the cytoanalyzer. This device can tell if cells are normal (left circle) or cancerous (right circle). For example, thyroid tissue has a special thirst for iodine. If offshoots of thyroid cancer travel to any part of the body, they, too, attract more iodine than do other tissues. A patient thought to have thyroid cancer is injected with radioactive iodine and is then placed under a scanner - an isotope counter. As the patient is moved under the scanner, impulses from the radioactive iodine indicate the areas in which bits of thyroid cancer have begun to grow. Often, with early detection, it is possible to remove these stray growths. 1. A lump or thickening in the breast or elsewhere. 2. Unusual bleeding or discharge from body opening. 3. Persistent indigestion or difficulty in swallowing. 4. Unexplained changes in bowel or bladder habits. 5. Persistent hoarseness or cough. 6. Changes in color or size of a mole or a wart. 7. Any sore that does not heal promptly. Don't wait for symptoms to become painful; pain is not an early cancer sign. Have a complete physical examination at least once a year. Cancer Research. Why does a cell go berserk and start multiplying wildly? Do germs upset the cell's own control centers? Does some chemical imbalance cause the cellular havoc we call cancer? In seeking the answers to these questions, the researcher would be almost helpless without electronic instruments to extend the limits of his perception. In addition to the many devices which are useful in detecting and treating cancer, electron microscopes and other electronically controlled instruments are now enabling us to study the structure of the cell itself. Such devices may turn up the clue which will lead to an understanding of the behavior of cancer cells. Electron microscopes enable researchers to see cell processes which are invisible to ordinary microscopes. 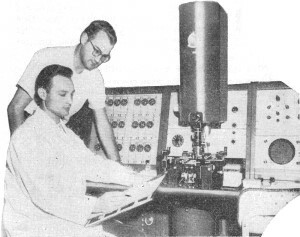 Research is also aided by the use of the mass spectrometer. It measures the relative weights of molecules by electronic means. Progress in cancer-therapy techniques has already raised the life-saving rate from one in four to one in three. But it is possible even today, says the American Cancer Society, to save half of all the people stricken by cancer by early diagnosis and treatment. Eventually, we will find out exactly what cancer is, why it starts, and how to cure it. 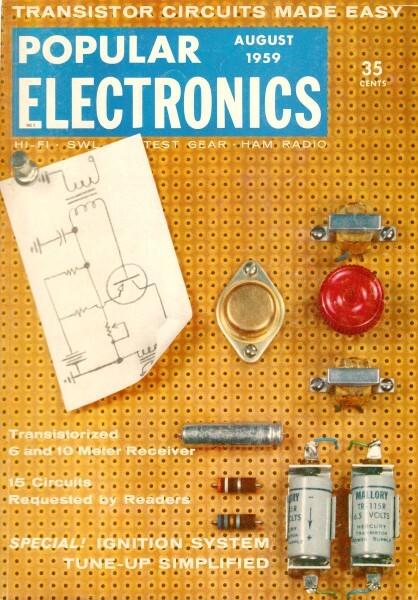 Until that time, medical electronics will continue to face its sternest challenge, the conquest of cancer.